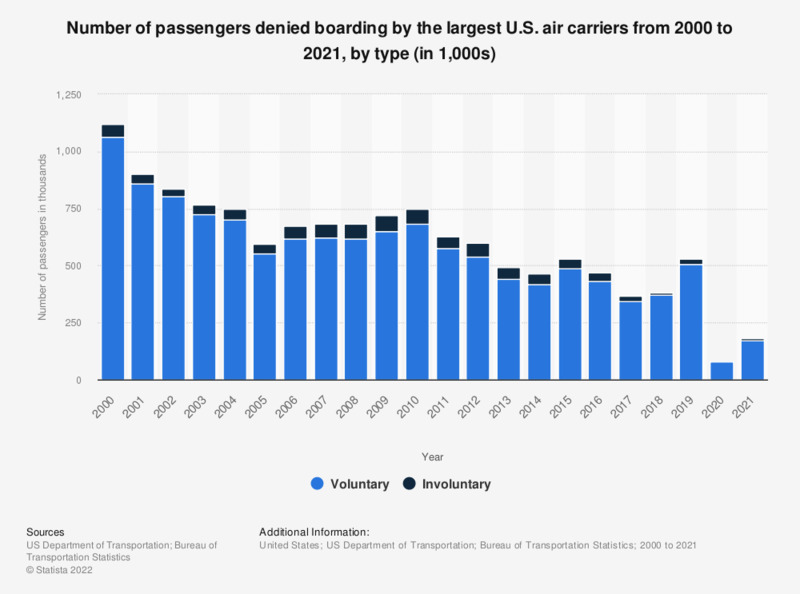 The time line shows the number of passengers denied boarding (voluntary and involuntary) by the largest U.S. air carriers from 2000 to 2018. In 2018, almost 12,000 passengers were denied boarding without their consent by the largest U.S. air carriers. Even though the number of people denied boarding is decreasing, the United passenger fiasco that happened in April 2017 raises questions on how the leading U.S. airlines treat their customers. The figures refer to the number of passengers who hold confirmed reservations and are denied boarding ("bumped") from a flight because it is oversold. These figures include only passengers whose oversold flight departs without them; they do not include passengers affected by cancelled, delayed or diverted flights. Data include nonstop scheduled service between points within the United States (including territories) by U.S. air carriers with at least 1 percent of the total domestic scheduled service passenger revenues and operate aircraft with a passenger capacity of 30 or more seats. Figures through 2017 were taken from previous editions.